March Beginning Wheel Throwing 1-Day Boot Camp! 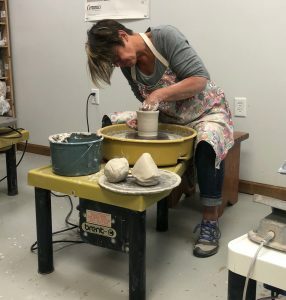 Have you been thinking about trying your skill at wheel throwing, but hesitate to commit to a 6-week class? Based on community feedback, the Warehouse is offering a 1-day boot camp to help you decide if wheel throwing is for you. Join Artist, Johanna Buwalda on Saturday, March 2nd. From 9:00 am-noon, participants will center, open, and pull ten consecutive vessels. Participants will then choose their two best and set them aside while they break for lunch. From 1:00 – 3:00 pm Johanna will demonstrate preparation for bisque firing which can include trimming and decoration. Participants will trim and prepare each of their two vessels. After the vessels are dried and fired, participants are invited to return to the Warehouse on Saturday, March 16th from 10:00 am–noon to learn about glazing and preparation for glaze firing. Participants will glaze their two vessels and stage them for glaze firing. Participants will be notified when their vessels are fired and ready for pick up. Cost is $70.00 (includes, clay, glaze, firings, and instruction). Space is limited.